COMMUNICATIONS MINISTER DENIS Naughten is due to meet with management figures from Facebook in New York tomorrow to discuss revelations about the social media network’s approach to harmful or illegal content. A Dispatches documentary that aired on Channel 4 last night reported that inappropriate, racist and violent content, including assaults on children and images of self-harm, all remained on Facebook despite being reported by users and reviewed by moderators. 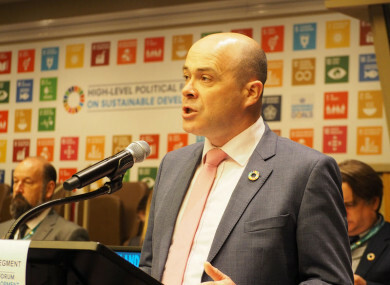 Naughten is currently in New York to attend the United Nations’ High Level Political Forum on Sustainable Development. The independent minister said he was “deeply concerned” about the content of the programme and had requested an “urgent” meeting with Facebook management. Naughten said the documentary raised “serious questions for the company in respect of the manner in which it handles reports of harmful or illegal content carried on its platform; the internal procedures it has in place to moderate harmful or illegal content on its platform; and the systems the company has in place to report instances of abuse, suspected abuse or other illegal activity to the appropriate authorities, including An Garda Síochána”. He added that Facebook has “failed to meet the standards the public rightly expects of it”. In a blog post, the company acknowledged that some of the programme’s content fell short of “the high standards we expect”. Email “Naughten to meet Facebook management to discuss 'deep concerns' about harmful content”. Feedback on “Naughten to meet Facebook management to discuss 'deep concerns' about harmful content”.